One peculiar aspect of Indian bureaucrats and their projects is that most of them fail to get the work done within the stipulated deadline and budget. The offering at hand brings us face to face with one man who defeated the tangles that beset our bureaucracy and governance, allowing room for excellence and becoming part of railway engineering folklore. Elattuvalapil Sreedharan, popularly known as the “Metro Man”, is largely credited for changing the face of public transport in India by his leadership in building Konkan Railway and the Delhi Metro, when he served as its managing director between 1995 and 2012. A celebrity in his own right, there is ample information about this technological genius in the public domain. There are detailed works on his life that seem to cover his professional efforts, methodology, the problems he faced, and the unique solutions he offered while completing key projects on time and within budget, as well as his ensuing success and glory. What new information about this man — known, revered and respected throughout the country — could be presented in this book? But as the biographer Rajendra B. Aklekar dug deeper, he came to realise that there was much that was unknown about Sreedharan. “There were many hidden aspects of his life; aspects never discussed or documented in the public domain, though there are official records and notes regarding a few,” Aklekar mentions in the preface while reminding readers that this biography — mainly based on personal interactions with Sreedharan at his residence in Kerala — focuses on little-known stories that have made him what he is today. Consider the national railway strike in 1974 for instance: The 20 day-strike by 1.7 million workers is perhaps the largest strike to hit Indian Railways till date but at that time, Sreedharan was busy designing a Metro rail network in Calcutta (now Kolkata) and therefore refused to halt his work. Then, in the build-up to the first Gulf War, there was fuel shortage in several countries around the globe, including India. The only project that managed to stand up against all odds at that point of time was the construction of Konkan Railway, headed by Sreedharan. “He had factored in all permutations and combinations, insulating the project from any hurdles by setting up petrol pumps with back-up supplies,” Aklekar writes. One would assume that Sreedharan — a man so dedicated to his cause and service — must have had a tough family life. But surprisingly, the “Metro Man” maintained a cordial balance between his work and family. In the biography, his daughter Shanthi Menon shares personal insights about her father, including how Sreedharan values family life and is involved in every small decision that is taken, paying attention to even the smallest needs of his grandchildren. And then there are critics too. A chapter titled “Bouquets and Brickbats”, provides enough space to his critics too. The biographer points out that not even one of his critics was willing to speak on record, but there were enough cases in the public domain for him to put together their points of view. The fundamental argument of his critics revolves around the fact that Sreedharan was given an unduly free hand, violated all established norms and, despite all of this, has been glorified. More than anything else, this biography holds significance particularly because Sreedharan himself sat patiently with the author to clear all his doubts and almost proof-read the draft of this book, giving it the status of an authorised biography. Finally this book is not a guide to the process that marked the construction of Konkan Railway or Delhi Metro. While these aspects are touched upon in the offering at hand, it is primarily the amazing story of one man – his perseverance, beliefs and public and private battles. 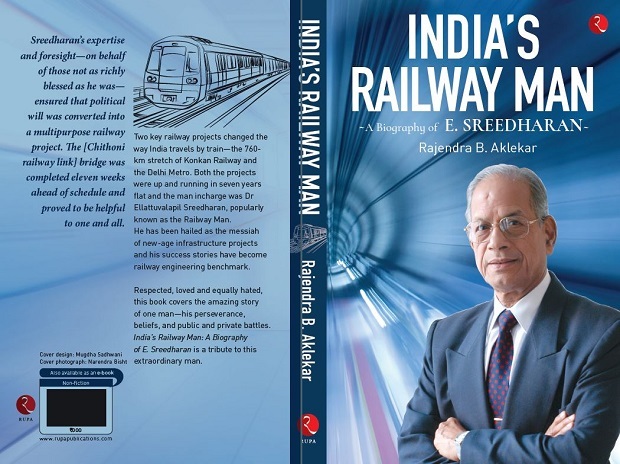 Highly anecdotal and sufficiently endnoted, “India’s Railway Man” is an inspirational book that opens up a life well-lived, against all odds and at constant service to the cause Sreedharan was involved in.